Reserve a Group Study Room. Group Study Rooms can accommodate up to 6 people. Reserve a Single Study Room. Single Study Rooms are for use by 1-2 people only. 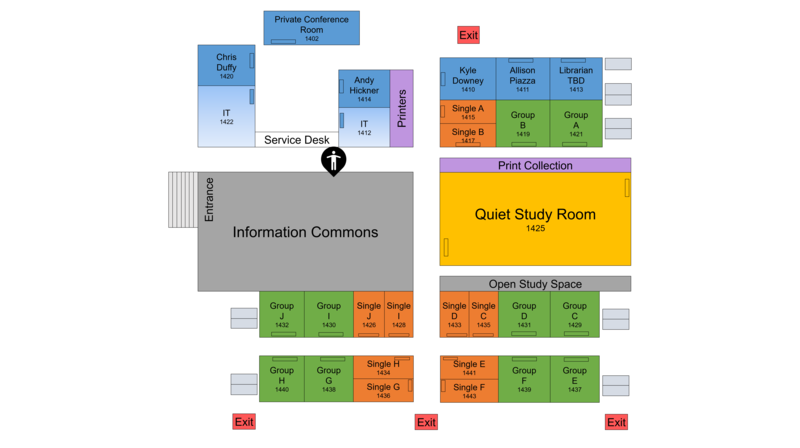 Group and Single Study Rooms are located throughout the IHS Library. Study rooms may be reserved by students and faculty of Seton Hall University and the Hackensack Meridian School of Medicine at Seton Hall. Reservations can be made in 30 minute increments. The maximum reservation time is 3 hours. Reservations can be made 7 days in advance. The complete list of study room policies can be found on our policies page. Each Group Study Room is equipped with a flat screen monitor and a white board.